One of the reasons why knee rovers for senior citizens are a necessity is because of the many knee problems that come along with aging. Aging affects joints, which in turn limits mobility. With every step, the wear and tear on the joints gets worse leading to persistent pain. This makes it difficult to walk without the need of something to take the weight off the painful knees. Knee surgery helps to fix a bad knee, but even after the surgery, it takes a while to gain optimum mobility especially for the elderly. Many of those recovering after the surgery opt to use crutches while others use wheelchairs. Others depend on people for support as they move around. However, there is a better alternative to clutches or dependency on people. Using knee scooter rovers is one of the best ways for seniors to manoeuvre their way around. Unlike clutches, knee rovers are more comfortable and do not tamper with the knee recovery. They are stable and great for both outdoors and indoors. Knee scooter rovers are also good not only for seniors with knee problems but also for those with broken ankles, broken feet and anyone recovering from any kind of leg, ankle and foot surgeries. What Makes Knee Rovers Better than Other Alternatives? The best knee rovers for senior citizens have the following advantages over clutches and other alternatives. Scooter rovers are more comfortable and reliable. Any senior using a rover over a clutch will not tire easily and his/her mobility will be more effective. Unlike crutches, knee rovers are more stable because they come with rubber wheels. This makes it easy to move around without the fear of any slip-ups. Besides the rubber wheels, scooter rovers come with handlebars for support Majority of them come with locking hand brakes that are easily adjustable and on-wheel brakes for better control. The majority of the scooter rovers are compact and lightweight, with weights not exceeding 30 pounds. The scooters are also easy to fold which makes them portable and easy to store. Knee scooter rovers are durable and can go for years without any damage. Despite the light weight, the knee scooter rovers can manage large weight capacities and different heights. Though there are many different kinds of knee scooter rovers in the market today, we have selected a few of the best. The above knee scooter is a creation from one of the biggest manufacturers of scooters. Made with aluminium, the scooter rover comes complete with a shock absorber. Other features of the KneeRover Pro are. Another great alternative to crutches is the beautiful steerable knee scooter from KneeRover. It comes in two beautiful colors and it offers comfort when recovering from a knee surgery or any other leg surgery.
. Weighs only 22 pounds but can support weights of up to 300 pounds.
. Comes with a large padded gel seat, which is convenient for mobility. The seat allows the user to elevate the leg bearing no weight. MANEUVERABILITY - With the easy to use Travel Pro Premium 3-Wheel Mobility Scooter by Pride, the three wheel styling provides maneuverability in tight spaces with a sharp turning radius and smooth drive. This mobility scooter offers the benefits of a high range travel mobility scooter such as a top speed of 4mph with a 6.3 mile drive range, flat free tires, forward/reverse controls, and a weight capacity of a whopping 275 lbs. TRANSPORTABLE - Designed to be easy to transport, this travel scooter can be quickly disassembled into 5 lightweight pieces that easily fit in the trunk of an average sized sedan. The heaviest piece is only 27.5 lbs, light enough for most users to be able to easily carry independently. COMFORT - Ride in comfort and style; this travel scooter features an attractive fully-padded faux-leather seat that offers an adjustable height to suit users of nearly all heights, as well as padded armrests that flip up for convenient boarding and exiting of the scooter and a convenient front basket for stowing away personal items. USES - Whether you or your loved one needs help getting around the house and shopping or desires the freedom to travel and keep up with the family, this travel scooter can easily maneuver around hallways and doorframes and is compact enough for use during travel. SPECS - Includes a free cup holder and saddlebag ($55 value) shipped separately. Overall Width: 22.3" x Overall Length: 37" x Seat Width: 17" x Max Seat to Deck Height: 17.25"
The above are some of the many knee rovers for seniors in the market today. All the items are available in Amazon at affordable prices. 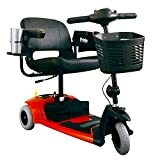 With the above knee scooter rovers, if you are a senior citizen, you can enjoy maneuvering around without any worries. You can forget the discomfort of the clutches and use the knee rovers that will offer you more comfort and stability. What is even better is that you can go anywhere you wish to go with the above best knee rovers for senior citizens. Take your knee rover for a spin and enjoy life without any pains holding you back. Click here to learn about more of the best healthcare products for senior citizens.